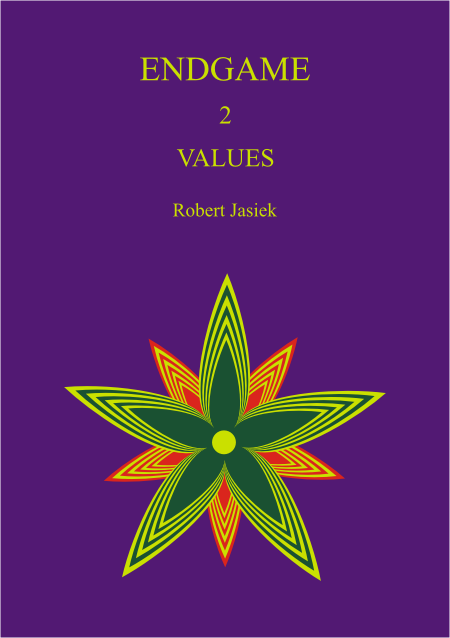 The author and publisher of Endgame 2 - Values is Robert Jasiek. The book is of A5 size, has 260 pages, has 6 diagrams per page on average, is written for players from 13 kyu to 9 pro and has the suggested price EUR 26.5 (book) or EUR 13.25 (PDF). The essential Endgame 2 - Values, which is the result of 2 years of work and research, teaches every relevant, basic aspect of endgame evaluation systematically, clearly and in detail. The comprehensive textbook explains modern and traditional endgame theories, the microendgame, and the impact of scoring. We evaluate positions, follow-up positions and moves so that all their values are consistent and related. The theory is well applicable to every endgame position and move, approximates absolute truth and is supported by many examples. The endgame dominates the second half, and affects every move of the first half, of the game. Over 97% of all endgame moves are decided by comparing their values while under 3% require new effort on tactical reading or tesujis. Therefore, understanding endgame values well has the potential of improving one's play by several ranks. Most endgame calculations are easy (much easier than tactical reading) but we must learn to apply the right calculations. Very little of modern endgame theory is part of prior verbal go theory or available through professional teaching. Previous, unstructured, incomplete, partly wrong information is scattered in thousands of messages throughout the web or the mathematical literature, which has limited practical relevance and must be reinterpreted for our application as go players. This unfortunate situation has had consequences. Most amateurs have neglected careful study of endgame values. Only a few other books on endgame values are worth mentioning. Writing about endgame evaluation, if it shall not only be trivial literature, is 10 times as demanding as writing go books on other topics. This book fills the gap in endgame value theory and the literature, collects all the basics, provides structure by starting with the most basic theory and then carefully developing the more sophisticated concepts. Now everybody can learn endgame calculations because the presentation emphasises easy application of the theory to examples. Instead of the strange phrases 'miai counting' and 'deiri counting', the book speaks of modern endgame theory and traditional endgame theory. Either theory needs to calibrate the different types of local endgame positions to enable the principle of usually playing a move with the largest move value. Modern endgame theory calibrates by dividing by 2 for a local gote. Instead, traditional endgame theory calibrates by multiplying by 2 for a move played in sente or reverse sente. The book explains both theories. It clarifies traditional endgame theory, which is more convenient when only comparing gote move values with each other. It explains modern endgame theory in detail. Why do the book, the planned further volumes and O Meien's Japanese book Yose - Absolute Counting emphasise modern endgame theory? It is very consistent in every respect so enables application of advanced theory easily and without limitation. For every aspect of endgame evaluation other than the aforementioned principle, modern endgame theory applies naturally while traditional endgame theory only applies with the artificial helping construction of first transforming its move values to those of modern endgame theory. Only modern endgame theory allows the following, and countless other, applications easily and consistently. In Volume 2: all values of positions, follow-up positions and moves are related to each other naturally; the close relation between counts, move values and other values to better evaluate moves and sequences; easy evaluation of ordinary ko exchanges; microendgame; area scoring. In later volumes: distinguishing local sente and gote objectively; evaluating local endgames with long sequences; correct move order of local endgames with follow-ups in the global positional context. In all volumes: identification of exceptional move orders contrary to the mentioned principle. Traditional endgame theory made slow progress because its move values are inconsistent for these applications. The book starts with the basics. It explains modern and traditional endgame theories, the microendgame, and differences of endgame evaluation under territory versus area scoring. It concludes with an appendix. Unfamiliar concepts are explained several times in different ways. After a preview of key concepts in the introduction, the second chapter explains the basic concepts cautiously so that nobody is lost when they are applied in later chapters. The book uses terms common in modern endgame evaluation (a follower is a follow-up position, the black or white follower is created by a sequence started by Black or White, a count is the value of a local endgame position, move value and so on) and introduces the convenient terms local gote versus local sente for a local endgame position that is a gote or a player's sente, respectively. In his local sente, the opponent might play in reverse sente. Besides a few additional terms and the method of reading and counting, we learn basic endgame strategy and some exciting exceptions, such as a player's local sente that is the opponent's global sente. Every student of endgame evaluation meets the two concepts 'difference value' and 'tally', which characterise move values. Although some online texts use the word 'swing', the book simply and clearly calls it what it is: the difference value of the counts of the black and white followers. The tally characterises different kinds of local endgames (local sente, local gote, ordinary ko and so on) by comparing the players' numbers of local plays. A few hard-to-find webpages and videos only say "gote / sente are calculated like this, same for follow-ups" but such is insufficient to enable understanding on a level of fluent application. For this purpose, the book explains every basic aspect very carefully so that all questions are answered and cannot create hurdles or block learning progress. The book provides enough examples and repetition. It is hard to reinvent everything on one's own, therefore the book already presents everything. Trying to only use earlier, insufficient, badly structured and partially wrong online resources for acquiring a firm understanding takes months for rediscovering much basic knowledge. The book saves the reader that much time. Modern endgame theory is not difficult but Endgame 2 - Values offers the first English presentation for learning it well enough to apply it regularly with confidence to every local endgame position. Instead of also counting territory on unaffected intersections, every example is evaluated in, and shows, its locale, that is, the relevant local region affected by the move sequences. Unlike in quite some other endgame study material, the concept avoids wasting time for adding and subtracting the same constant amount of territory outside the locale. The book explains how to start from the counts of settled followers, derive the values of intermediate positions and eventually those of the initial local endgame. After explaining the counts of a local gote or sente and move values, the book enters previously often neglected aspects of endgame theory. When studying local sentes or local endgames with long sequences carefully, one notices that Black's and White's moves do not always gain the same amount of points. The concepts of gain or net profit describe value changes for a particular player's move or sequence, respectively. The book describes every useful relation between the values and demonstrates applications. Simple and clear value diagrams support the reader's understanding. The value relations offer additional tools for evaluating local gotes, establish the same kind of calculation of the count of a local gote, ordinary ko or ko threat, and are essential for evaluating kos. The book clarifies determination of the count and move value of several regions considered together. We see calculations of every combination of follow-ups: local gote with gote or sente follow-ups; local sente with gote or sente follow-ups. The book covers ordinary kos and shortly introduces approach and stage kos. For modern and traditional endgame theory, we learn how to compare the different types of local endgames. The chapter on modern endgame theory concludes with an illustration of every kind of accidental mistake in evaluation in order of decreasing frequency. Every section starts with theory and concludes with examples. Theoretical explanations and example comments are as detailed as necessary. An explanation can be short or cover three pages. Theory can contain principles or formulas in bold font. Each formula is also described in words. The example comments proceed step by step, as do the calculations. If values depend on other values of followers, the iterative calculation is often done move by move. Endgame value calculations are new to many readers so every reader has the chance to follow the careful and detailed explanations. The many diagrams and informative captions assist the learning process. Have you read the book Mathematical Go Endgames several times and still not understood chilling and infinitesimals to play the microendgame correctly? Instead of pure mathematics, we players need applicable theory. Therefore, Endgame 2 - Values evaluates corridors by counts and move values, uses easily understood terms (such as gold denoting a valuable end of a corridor), abandons infinitesimals to reinterpret correct play in some corridors as capturing races and abandons go theory encrypted in a mathematical proof to use principles for teaching reductions of corridors from an unconnected attacking string. Explanations, principles, methods, formulas and tables convey the theory. We use ordinary counts and move values instead of chilled values. Therefore we can easily compare the values to those occurring earlier during the endgame. Although the formulas and tables state the counts and move values, we calculate them in examples for every type of corridor so that we acquire a firm understanding and recall the theory more easily. There is a general move order for the standard types of shapes occurring during the microendgame. If we only had to believe it, learning it would be hard. Therefore, every relevant combination of different types of shapes is studied by principles and examples. Most chapters explain endgame theory under territory scoring (Japanese / Korean style). Since there are also countries and tournaments with area scoring (Chinese / AGA / Ing style), the related chapter explains its consequences and relation to territory scoring for each relevant aspect: how to avoid counting all the stones on the board; the detailed relations between score, winner and komi (more complete and general than in my earlier studies); calculation of count and move value; the relation between local territory count and local area count; the strategic differences. The appendix contains much more than a list of conventions and keywords. 15 carefully selected problems are a test with which the reader can check his understanding of the major theory. The other long section of the appendix rescues everybody having forgotten his school mathematics: everything needed for endgame calculations is explained. The book's theory of endgame evaluation has an extraordinarily high quality because the principles, methods and value calculations rely on mathematical theory. Therefore, much of the theory of endgame evaluation represents, or closely approximates, absolute truths. This is the best possible quality, often superior to advice from professional players. Higher precision is only achieved by also applying the theory of the planned later volumes (see further below), and the mathematical theorems and their proofs in a later volume or the mathematical literature. The reader of this book is not confronted with the mathematical background but benefits from it. The book is suitable for kyus, amateur dans and professional dans because everybody can do the value calculations and learn new, better theory. Although more professional players become aware of modern endgame theory, the book also contains new contents that they cannot have known before: move order in the microendgame described in a language easily applicable for players; unconnected reductions of corridors; details of scoring relations. The following is described clearly instead of previous either informal or mathematical expert descriptions: relations between counts, move value and gains; evaluation of ko exchanges. The theory of endgame evaluation is very relevant as it applies to every move and every local endgame of every position with these exceptions: later volumes explain details, difficult shapes and the global context; complex kos require more advanced theory. The great consistency and scope of application of modern endgame theory has already been described further above. For even greater consistency in the book and later volumes, the same variables (such as C for count or M for move value) are used everywhere. "Since the book only has easy examples, it is for absolute beginners." This book (like O Meien's book) restricts itself to easy examples to make understanding and learning the theory as easy as possible. The theory shall not be buried under difficult examples. Instead, Volume 4 will have a great variety of shapes. "Since the book calculates values, it is only for mathematically skilled persons." For example, the book contains the principle "The count C of a local gote is the average of the counts B and W of its followers: C = (B + W) / 2." and calculations like the following for a particular example of a local gote: "The count of the black follower is B = 14. The count of the white follower is W = -28. The count C of the initial position is the average of the counts of its followers: C = (B + W) / 2 = (14 + (-28)) / 2 = (14 - 28) / 2 = -14 / 2 = -7." The calculation is described by text, the formula and the actual values so everybody can learn in his preferred way. Repeated stating of the same text and formula for every example supports learning of the calculation in general for every local gote. If the reader needs additional explanation for calculations with brackets, negative numbers or 'the average of two numbers', he can consult the reference chapter introducing school mathematics. If you understand the cited calculation of representative difficulty, you can understand all calculations in the book. Under-estimating the quality of the theory: The theory is very consistent and generally applicable to every example. It is often the best possible theory representing, or closely approximating, absolute truth. The book has theory and examples but does not train tactical reading or tesujis. It is not a problem book. It does not teach the contents of the planned further volumes. School mathematics is sufficient for understanding the book, which avoids all advanced mathematics, such as trees, thermographs, cooling, infinitesimals, combinatorial game theory, calculus. Layout and typography have not been optimised so far that Volume 2 would have to be split into two books. Apart from mentioning the occasional typo, shouldn't the author be more critical in his own review? I do not think that the book contains too much contents or should introduce the reader to the basic concepts even more cautiously. I wish I could have learnt endgame value theory anywhere else even remotely as clearly as in this book or O Meien's book, so why might I criticise didactics? This What the Book is Not section points out the only noteworthy drawback of the textbook: every aspect of theory is illustrated by examples and their comments but not also by immediate training with problems. Of course, frequent interludes with problems would have been possible - if the one book was split into two or three books. The prospect would be a series of one or two dozen (instead of the planned six) volumes. I have resisted the temptation...! Volume 1: Kyus might ask whether to read Volume 1 or 2. They are complementary and can be read successively or consulted both. Volume 1 studies the endgame from a value-less perspective while Volume 2 uses values. Volume 1 is easier but one cannot escape decisions between moves of similar values requiring their calculation. Endgame books training tactical reading: They are complementary but training of tactical reading has greater application for the middle game because almost all endgame moves are simple, connected boundary plays. Endgame tesuji books: They are complementary. Also read them so that you find the one, two or sometimes few endgame tesujis per game. Books using traditional endgame theory: Typically, they only teach approximate calculation of move values but hardly anything else about endgame evaluation. Such books involve a great danger of keeping one's endgame evaluation at a low level. Counts of followers tend to be neglected. Local move sequences are often too long without good appreciation of intermediate plays elsewhere. O Meien's book: You only understand this good book if you read Japanese or already know all the theory explained in this book. It teaches the very basics of modern endgame theory for local endgames and the most basic global decisions. Endgame 2 - Values teaches more, more details and also the microendgame, scoring and school mathematics but avoids global decisions before the microendgame because they will be the topic of Volume 5. O Meien's book is well worth reading but non-essential if you read Endgame 2 - Values. On the other hand, modern endgame theory has been neglected in the other literature so reading both books can further improve one's understanding. Mathematical Go Endgames: This is as much a book of correct, advanced mathematics as of the microendgame. Understanding the very dense contents is very hard. Reading the book several times meticulously can improve your score by another point, provided you have studied some mathematics at university. First read the extraordinarily easier chapter Microendgame in Endgame 2 - Values. Endgame 2 - Values is the urgently needed, comprehensive textbook on endgame evaluation. It is written to be the standard reference everybody above absolute beginner level should read. The book contains all the relevant, basic theory. It includes aspects and methods often neglected by professional players. Good structure, great clarity and detailed explanations raise understanding to the level of fluent application. This book, and drafts of further volumes, are the result of 2 years of full-time work, of which 50% (instead of my usual up to 5%) has been research in the theory of endgame evaluation. I have also proved, and will publish later, related mathematical theorems to establish most of the new theory as absolute truth. The research has been necessary to fill huge gaps in earlier theory and create a consistent, sufficiently complete, well applicable theory. While I have learnt 10% from the endgame researcher Bill Spight and 10% from other sources (of which almost 0% are from professional players), I have had to discover and prove 80% by myself. I have planned these further volumes but Volume 5 might be split if a volume for global problems should be added. The table of contents is available at the author's site.